I’ve heard of folks going back to someone who cheated on them because the cheater begged for forgiveness. By then the trust was blown to bits, but they’d still go back. “I feel like I should try again, just so I can say I did try again.” They’d breakup with the rebound and return to the cheater. And they’d be miserable, waiting for their past relationship — before the cheater contemplated cheating — to resurrect itself. The problem is that once someone cheats, the relationship is never the same. Why? Because the cheater has finally revealed their true selves. Their true intentions. At that point iff the couple “tries again,” they’re just “settling.” The cheater begged forgiveness because they know they’ve ruined a good thing, but more so because they want the partner to see them once more in that angelic light. Someone who goes back to a cheater is just settling. And the cheater won. I agree 100 %. I’m glad that when my ex cheated, he wanted to be with the other woman and I didn’t feel any pressure to go back to him whatsoever. It’s really hard. The other person makes you feel weak, makes you feel as though they would do anything for you, and then they leave you in a pile of dust with absolutely nothing. But, I can see why people do go back to the cheaters. 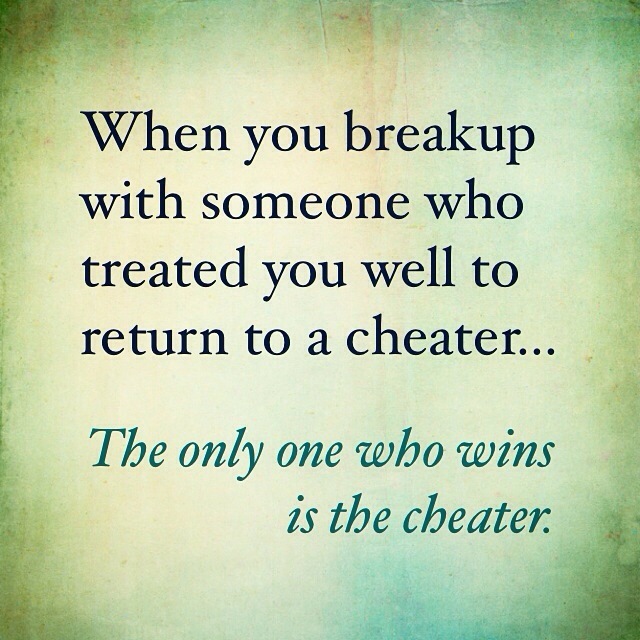 And yes, then it does unfortunately mean the cheater has won. I often wonder how people can cheat and then beg for the other person to stay. Dont they feel guilty? I know I would. Next Entry Disney here I come!